The Maestro integrated amplifier is a big machine with a thick polished metal front, a huge knob for volume control and a few LED indicators. It captures your attention because of its monstrous volume control knob (9 cm diameter! ), its heavy metal looks, its size and… its weight. You cannot just look and walk away. Placing this huge machine on a rack can be difficult and even dangerous because it weighs over 100 lbs. The main power switch is placed on the back and it is difficult to reach. It invites you to leave this machine in standby. The sides are huge heat sinks which are sharp and could perhaps be dangerous when you want to move to machine since there are no handles. On the back you can find the usual inputs as well as balanced XLRs. The rounded metal remote-control is a nice piece of modern art. It is quite heavy, can’t actually control very much and it requires a precise aim at the Maestro but it is simply gorgeous. The only problem is that it can only control the Maestro amplifier and doesn't work with other Audio Analogue products. The Maestro MKII CD player would be a natural companion for the Maestro amplifier. However this machine has a cheap plastic remote-control which looks completely different. It would have been an elegant solution to have one nice remote-control which works with all models from the same company, the way B&O do it, just to give an example. So the first thing you do when you receive the Maestro at your home is to remove the 100 lb machine from a huge and robust wooden case. As you attempt to do this you realize the machine does not have handles and it is therefore very difficult to move. Because of this simple fact one should carefully plan the final "resting place" of the Maestro. As we said before you need a very robust and stable rack. The Maestro should be placed on the lower levels but then consider how you are going to reach its main power switch. Just think about it. Most people would be tempted to leave the Maestro in standby. The manufacturer advises leaving the machine in standby but I would rather turn it on and off every two or three days. You should realize that the Maestro, even in standby, can produce a lot of heat and that all equipment above it will be heated accordingly. Usually this is not a problem because the different components are separated by the sections of the rack. As I'm using a spider without any separators it was necessary to build one to protect the CD player from the heat generated by the Maestro. The Maestro is a wonderful machine but it requires very stable and robust placement. Its looks are very defined and personal. I think it's a gorgeous object of modern Art that can live with you for many years. Several other machines can be placed side-by-side with the Maestro as long as they have the same polished aluminum front panel. AA produces a CD player which carries the same name and has a very similar look. Other Manufacturers (like Accuphase) follow a different policy and use a distinctive colour or feature which makes it difficult to match them with "foreign" machines. Audio Analogue products like the Maestro can be matched with wooden elements as well, as these will "warm" it up a bit (see for instance the wooden legs of the Finite Elemente Spider rack). 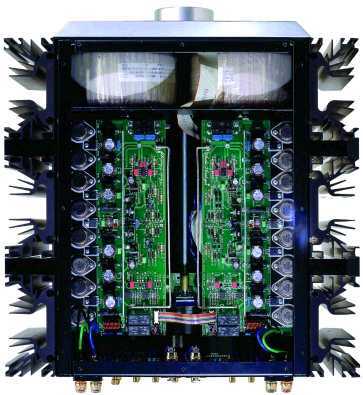 The Maestro is a modern solid-state amplifier which has a huge power reserve. It is well balanced in all frequency regions and produces a well-focused soundstage in all three dimensions. Because of its power and speed it has impressive dynamics and I was never able to get it into trouble. I have to recognize that I do not to listen to music at extremely high levels and therefore it is possible that other people will achieve different results if they like to hear Music above airplane taking-off sound levels. The manufacturer has tried to reproduce an elegant and well articulated midrange without emphasis. I consider this to be a feature of a modern solid-state amplifier. The Maestro has no problems to give heavy kicks, but only if necessary. One of the very nice features about the Maestro is that it can play good music even at low volume. Bass is there and the tonal balance is outstanding. Background music can be reproduced very well. If you like to hear music at low volumes then you'll be very happy about the results. By raising the volume just a bit you can achieve impressive results with the appropriate musialc genre, that is with chamber music and the like. You can increase the sound pressure just as much you want. The Maestro can play hard, it doesn’t get tired and listeners do not get fatigued. This is a feature of high-end equipment. There is no emphasis at either end of the frequency range. All musical styles are reproduced in an honest way and never exaggerated. Voices are natural and without emphasis. You get the feeling that the Maestro has everything under control according to the needs of the moments and to the requirements of the music. The stage reproduction is very convincing in all three dimensions but it is never exaggerated. You never get the feeling that the Maestro is trying to overstretch one dimension over the others. With the appropriate high-quality music the speakers disappear. The different instruments and voices are well placed in space and the stage develops itself very well in length, width and height (which is not always very easy to achieve). The Maestro phono section can work with MM and MC systems. To switch from MM to MC one has to open the unit - not difficult but possibly tricky when the machine is placed on a rack with other components on top. I personally tried it with two MC cartridges and one MM. The MM pickup which I tried first (an Ortofon at about 100 €) produced a loud low pitched hum. This did not disappear after earthing, increasing distances between appliances, transformer insulation, new arm cables (Rega RB 300 now with Cardas-Incognito). However it did become better. Even though the Maestro never had any problems it could have been that the phono section of this particular machine was defective. To verify this, I tested a second Maestro at my dealer’s shop with the same MM system, Kuzma arm (earthed) and Acoustic Signature turntable. We placed the turntable far from the Maestro transformer but the noise - although improved - did not disappear. The MC systems which I tested (low end Ortofon and Van den Hul DDT II Special) produced an even louder hum. The noise finally disappeared when I connected the turntable to an external pre phono such as the Trigon Vanguard. The Manufacturer told me they never experienced problems with MM or MC systems. Conclusion: the phono section should be checked, particularly with MC systems. I listened to several artists and performances on LP and CD to test the Maestro’s overall performance in different situations. The recordings are of different quality. Ella’s voice is however always clean and well articulated, rich in details, fine and powerful. Instruments are perfectly reproduced. It is an excellent recording and a very polished performance. The Maestro reproduces voices with a vivid sense of realism. Bass is deep, top! I like Cash and this could have biased my judgment. However Cash’s version of "In my life" is a milestone. "Hurt" sounds like his last will. Fantastic dynamics. Very realistic reproduction of strings. Excellent stage reconstruction, with some flaws in a couple of concerts, certainly due to imperfect mixing. The Maestro can only reproduce what is in the grooves. The CD is good but slightly more "digital", bass is deeper on the LP. Some flaws in 3D reconstruction and focusing. If you like "Buena Vista Social Club" but you think it is now a little "passé" then try the deepest rumba in the world. No problem for the Maestro than can go deeper and deeper and deeper…No sense of fatigue and always excellent control and articulation. The small orchestra and the good recording give you a good 3D sense. Depth is excellent. The stage is well developed in 3 dimensions. The good stage height is typical of high-end machines. Remote control from "Museum of modern Art"
The Maestro integrated amplifier is an excellent sounding machine. It is well built, has a rock solid face and original looks. It is a modern solid state amplifier in the best possible way: powerful, quick, clean but never rude, rough or exaggerated. It can go deep but always in perfect control of the situation. Its music reproduction is without emphasis. Even after hours of listening at high volume you do not feel tired. Is it worth its money? First it should be clear that in our globalized world prices are volatile. In Italy it sells for 4250 € but in Germany for 4650 €. Street prices are lower, of course. Here in Germany I think it can run against machines that cost between 5000 and 7000 € without any problems. Its bass section is however even more impressive. For people who prefer tubes I can only recommend to buy tubes because the Maestro is solid state and it sounds that way. To people who demand gigantic stages I should remind that the Maestro does not artificially expand the size of the orchestra just to give a "grand" feeling". It is just correct. The same can be said about the reproduction of distinct frequencies: no emphasis here. The Maestro is equilibrated but not dull. Who should buy it? At this price it is no mystery that the offer is huge. The potential buyer is someone who wants a very powerful solid state integrated amplifier that can work with any speakers. This potential buyer also likes clean elegant sound with no special effects like killer trebles or monster uncontrolled basses (cheap trick of some smaller machines). They also do not care about bass/treble controls (the Maestro is minimalist). They wants a well defined look that does not follow trends and does not copy other famous brands (see Vincent and Mark Levinson, or Usher and Sonus Faber). At this price I have found no clearly better amplifier in terms of overall performance. But if you need power and you need it with control then I think you will have to pay at least twice to get similar performance.